Several months ago the Golf Writers’ Association of America sent out a reminder to apply for press credentials for the 2013 United States Open at Merion Golf Club in Ardmore, PA. I tried once before to obtain a clearance for a USGA tournament without success, so I had no real hopes for any greater luck this year. 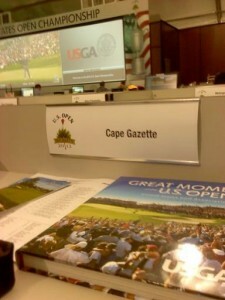 The assigned seat for The Cape Gazette at the Media Center for the U.S. Open at Merion was sandwiched between seats for Sports Illustrated and Time Magazine. 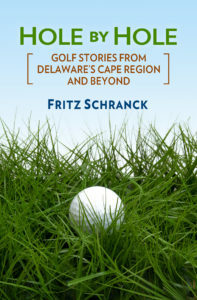 This time this column and the Cape Gazette met the USGA’s standards for Local Media. I was on my way. It just so happened that I had already used my longtime USGA membership to buy two four-day passes for the Open. The press pass meant that my previous plans to bring friends and family to the Open would have to be adjusted. Fortunately, it also meant that I had already made my hotel arrangements, which leads me to the first tip for those considering a trip to see the Open next year at Pinehurst No. 2, in North Carolina. Plan ahead. Plan well ahead. You will otherwise be surprised at the lack of reasonably priced accommodations when the Open comes to town. With my hotel reservations in place, I left work the Wednesday afternoon before the Open to go to Merion and complete the credentialing process. A relatively easy drive up I-476 led to Lot V at The Haverford School, several blocks from the course, where Local Media were to park and use a dedicated shuttle service. Thanks to recent events such as the Boston Marathon bombing, security was tight. Papers were checked, bags were x-rayed, metal detectors of the walk-through and scan variety were in place, and serious-looking folks with badges were much in evidence. Bags larger than 8” by 8” by 8” needed their own credentials to be carried onto the property. Cell phones, PDAs, and cameras were not allowed in the Open during the competition, though permitted during practice rounds. Nonetheless, I saw a few dozen fans yammering away on their cell phones on the course during the next four days, so the screening process wasn’t completely failsafe. The Media Center itself was guarded, but the USGA folks inside were pleasant and polite. I signed for my assigned seat (H37) sandwiched between slots for Sports Illustrated and Time Magazine. Each seat had its own power strip, with unobstructed views of a giant TV screen stretching nearly the entire length of the massive tent. We also had our own dedicated food service area (free), restrooms, and a very handy locker room to store electronics while out covering the tournament. I walked around the course for a bit, chatted with a few reporters I know, and headed back to my hotel. On Thursday, I arrived at Lot V at 5:15 a.m., and was not the first one there. One van full of photographers and reporters was just leaving, and I was part of the next, fully loaded shuttle heading to Merion. I always enjoy watching how an event comes together for a scheduled start. On this occasion, lots of prepping was going on simultaneously. Segments of rough were receiving a last careful cut, a few crews of about a dozen each were carefully arranging the hole locations on each green, concessionaires were delivering huge stacks of food and drink, and cameramen were quietly chatting as they prepositioned themselves out on the course. I walked over to the stands behind the 15th green, and chatted with another early bird spectator, Linda, from Boiling Springs, PA. Her husband Bill and son-in-law Jeffrey were working as USGA volunteers. Bill worked as a volunteer at the 2011 Open at Congressional, and was already accepted for additional volunteer work at the 2014 Open at Pinehurst. Here’s the next tip. Volunteering at the Open can be a lot of fun, is apparently addictive, and the USGA needs about 5,000 such helpers for each Open. Apply early, if you’re interested, because folks will come from all over to join the effort. The Kings Creek Country Club Ladies 18 Hole Golf League played a Team Net Stableford format June 20. Vicki Tull, Prabhat Karapurkar, Ana Dittell, and Denise Stewart won first place. Second place honors went to Marsha McLaurin, Denise Sills, Melanie Pereria, and Betsy Alwood. Marilyn Hewitt, Sherry Pie’, Carol Ellison, and Vicki Tull (as the blind draw) finished in third.